Apologies for the lack of posts. We lost “wee fee” (as they say around here) in our Paris apartment for no apparent reason on April 3 and haven’t been able to get it back. Today is our last full day in Paris. How the last four weeks here has flown! Fahbio kindly suggested that he wait while I went for a coffee in a nice cafe. Onlyboy and Paris insisted they come with me. Café crème for me (I noticed that Parisians don’t call it “café au lait”) and chocolats for the kids. In the end, we waited about 90 minutes to get in. But as Firstborn pointed out while we were down there, it was better to arrive when we did and to wait because if we had gone in with the first wave, we would have been surrounded by many people. As it was, we were usually the only people within sight or earshot. 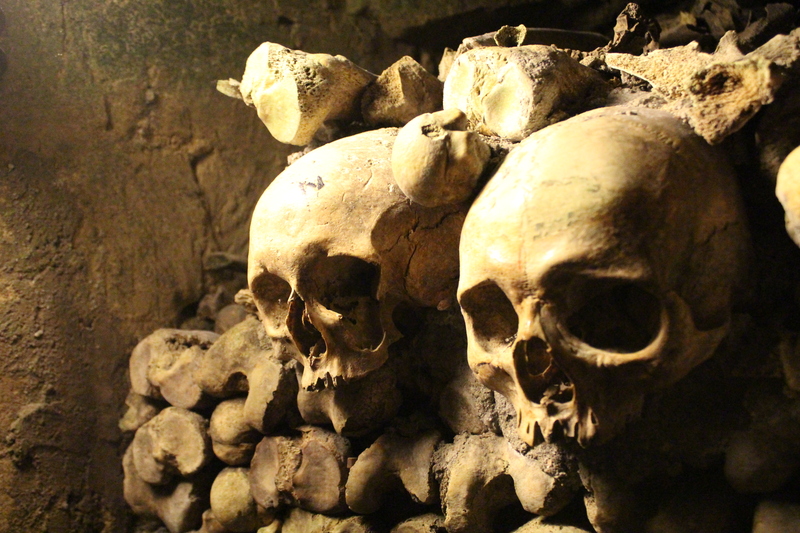 The catacombs are a series of tunnels below central Paris. In the middle ages, the area was on the outskirts of the city and contained the quarries that provided the stone used to build this medieval capital. 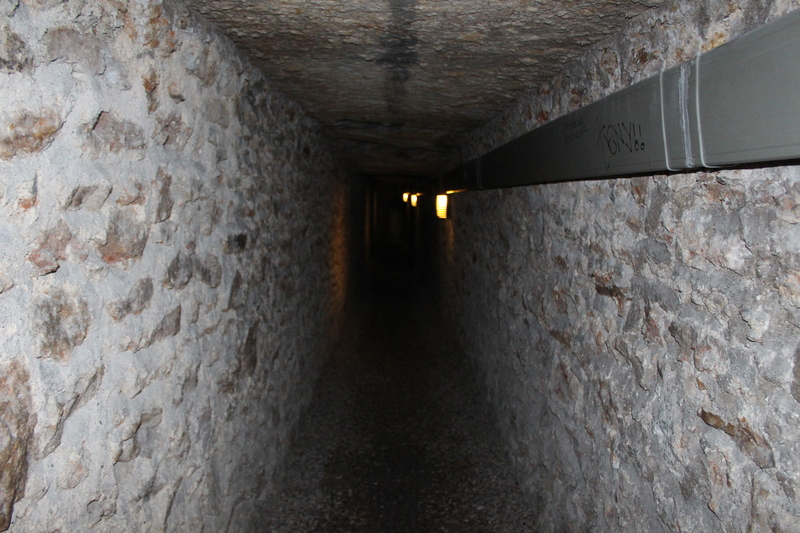 Eventually the quarries were closed and over time, people forgot that the tunnels existed. 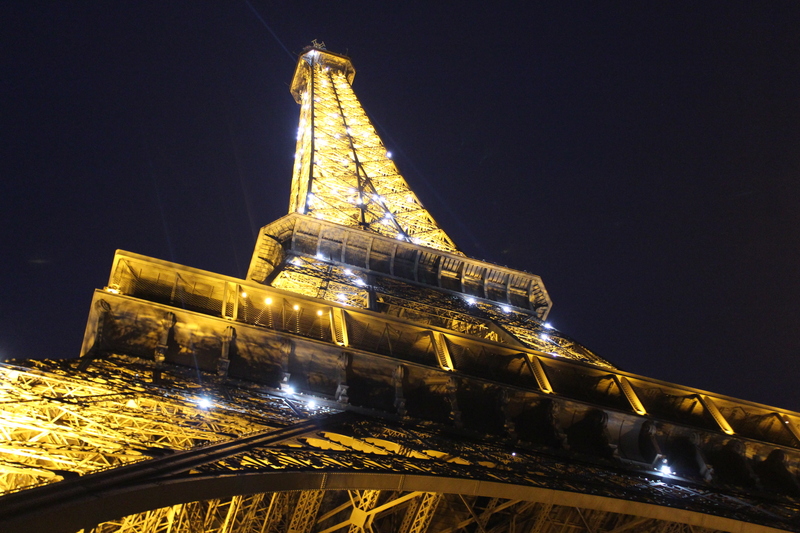 In the 1700s, new construction led to several tunnel cave-ins in Paris at which time they were rediscovered. 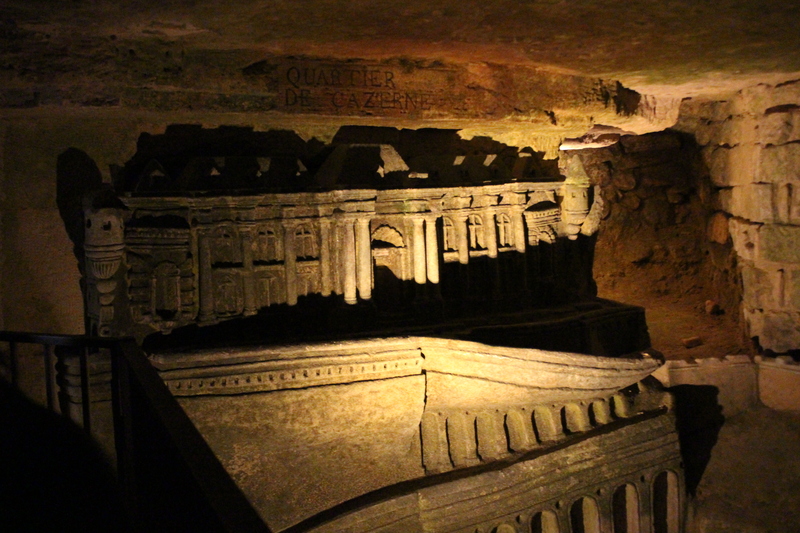 NOTE: The February 2011 edition of National Geographic magazine contains an excellent article on Paris’ underground tunnels, of which the catacombs make up a small fraction. We were lucky enough to have read it before our trip and it really provided a good background and context to our visit. 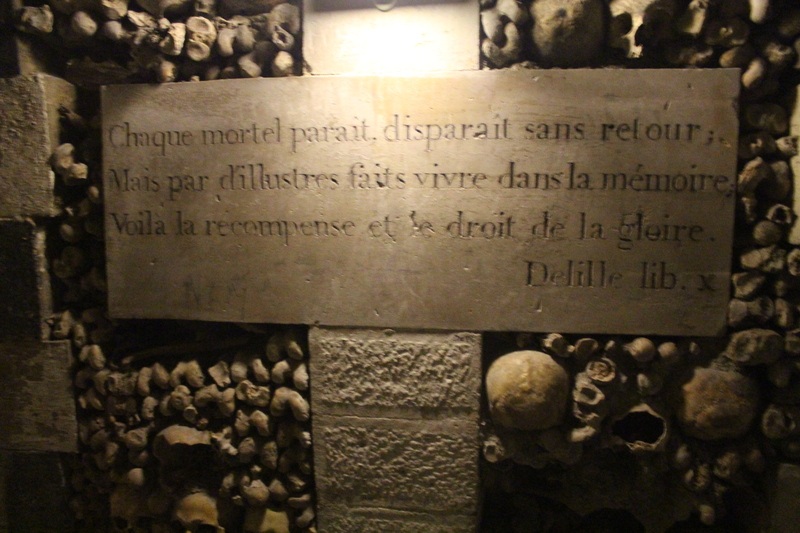 In the 1780s, it was decided to transfer the remains of those buried in the Cimetière des Innocents to the catacombs because the graveyard was a public health hazard. Between then and the mid-1800s, the bones of 6 million (!) 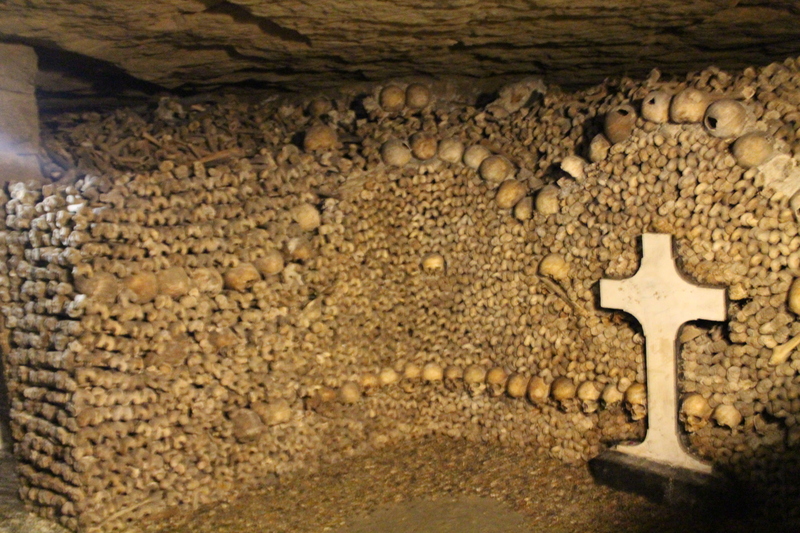 Parisians were dug up from various cemeteries and were placed in the ossuary. The bones were artistically stacked and the sheer volume unbelievable. 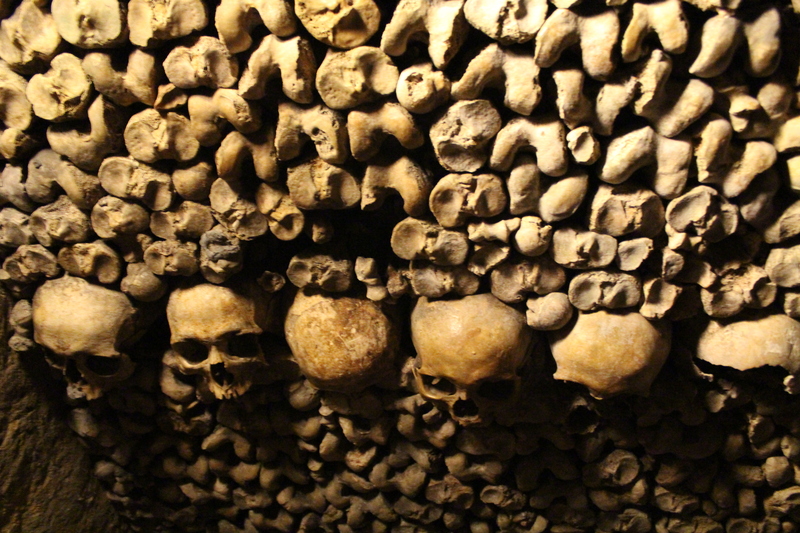 The catacombs wound for 2 kilometres and much of that distance was lined with bones. They were interspersed by sayings and inscriptions and carvings dating from the late 1700s. As well as the occasional fountain, altar, well, and prison carved from memory by a former soldier. The dim lighting (so faint that some plaques couldn’t be read) contributed to a sort of creepy, sort of solemn atmosphere. All in all it was a moving experience that was well worth the wait. At 8 euros per adult ($12), 4 euros for 14-26 year olds ($6) and free for everyone 13 and under, it was also very reasonably priced (about $30 for our family of 7). 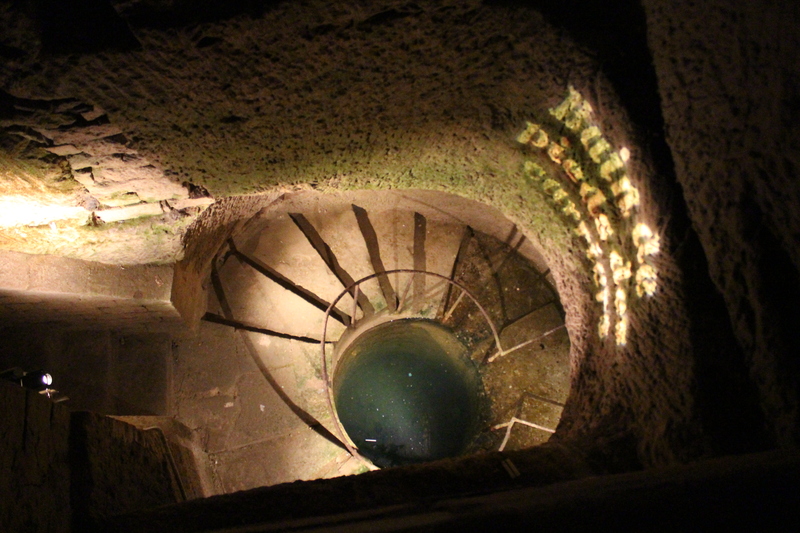 It was 130 steps down to the catacombs and 83 steps to get back out and we felt that our apartment had prepared us well for the task. Most people had to stop for breaks on the climb up and emerged huffing and puffing whereas after 4 weeks of training for the mountain goat Olympics we charged up those stairs like nobody’s business. As an aside, we buy two baguettes every morning and whoever has the task of getting them walks 105 steps down from our apartment, 80 steps up the sidewalk, 80 steps back down the sidewalk and another 105 steps up to our place before they have even had breakfast. Aside #2: When you get off the metro by our apartment, there is a sign warning you of the 92 steps you must climb to exit the station! The stone that came out of the catacombs was used to build many of the most iconic buildings of Paris, including Notre Dame de Paris. 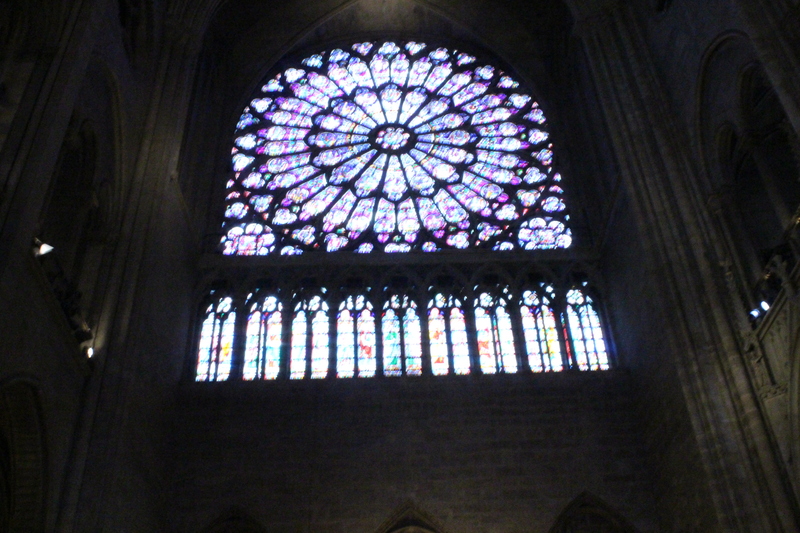 So another day, we decided to go back to Notre Dame to take a closer look at something we had only thrown a perfunctory passing glance at. Coincidentally, on Thursdays at 2 pm, the church offered both an English and an Italian tour. So Paris and I took the English tour and Firstborn attempted the Italian tour after 3 years of Italian classes back home. Fahbio who grew up in a very Catholic family got the heebie jeebies and got out of there as fast as he could, proclaiming he was “done with churches.” Unfortunately, the Italian guide began by apologizing for her Italian accent (she was French) and then said her throat was too sore to speak up (“Would anyone have an extra lozenge?”). Bad luck. 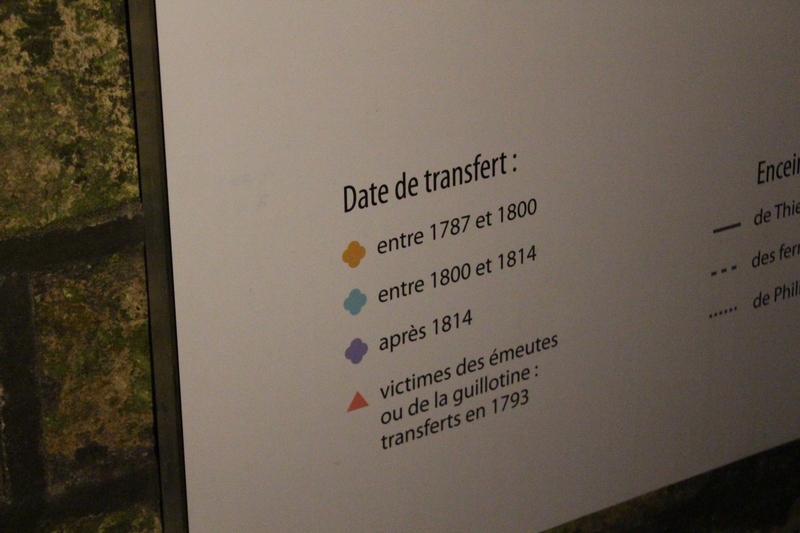 In retrospect, it was unlikely that an Italian tour in Paris would be guided by a native speaker. Firstborn hung in there for a long while before striking up a conversation with some of the Italians and losing the group. Paris and I had a fabulous experience. Our group was huge at 30 people but our guide was amazing. She did have a very strong French accent but would literally spell out words and names of importance. This was very helpful to some people in the group who were armed with notebooks and pens. I was under the impression that the tour would be 30 minutes but when I asked, I was told it was “approximately” 60 minutes. In reality, the tour took 2 hours (!!!) and every single minute was fascinating. Our guide was so knowledgeable and showed us many things we would never have seen on our own: the oldest living tree in Paris planted in 1602 (across the bridge); the new bells recently commissioned to celebrate the 850th birthday of Notre Dame; the maker’s marks of the stone cutters on several pillars; and the “Mays” – expensive artworks traditionally donated by guilds and wealthy patrons on May 1. She was also able to take us into parts of the church that were closed to the public. 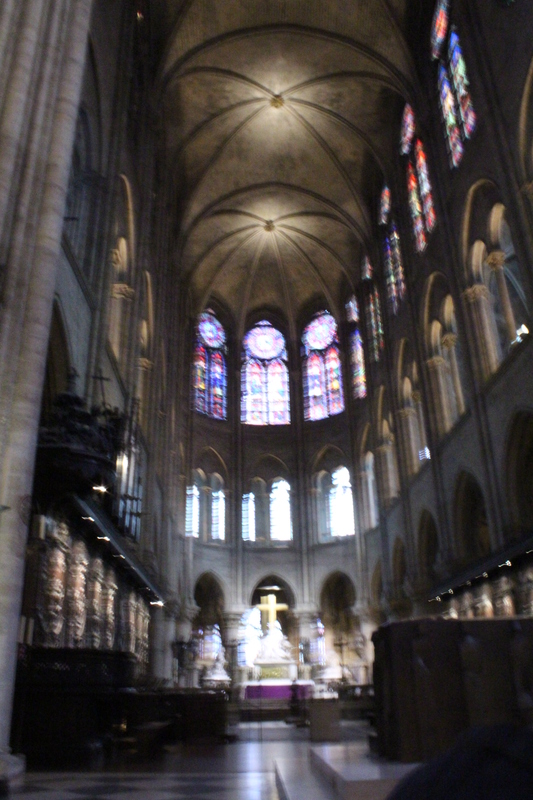 Although the tour was offered for free by C.A.S.A., (Communauté d’Accueil dans les Sites Artistiques) and presents a “Christian message by examining the cathedral as a work of art and the artwork it houses”, the tour was not religious and one did not need any background knowledge of Catholicism/christianity beyond the absolute basics to fully absorb the information presented by our outstanding guide, Marie. The tour was free but in my humble opinion was well worth $20. Speaking of which, CASA accepts donations because in the summer, these tours are given by young people from all over the world and CASA needs assistance to pay for their food and lodging. Since then we have been to Notre Dame a few times. In fact, we were back there again today on our last day in Paris. No, not because we have suddenly converted to Catholicism or become rabid historians. Rather because dear friends of ours who are serious foodies and very familiar with Paris advised us that the “Esmeralda” serves a ham and cheese crêpe worthy of three Michelin stars. If you are in Paris and want to experience this delight, face Notre Dame and walk down the left side of the church to the end of the park behind the church. The Esmeralda will be on your left. Take your crêpe into the park and enjoy a heady combination of gluten and flying buttresses. Good bye Paris! What an adventure ! 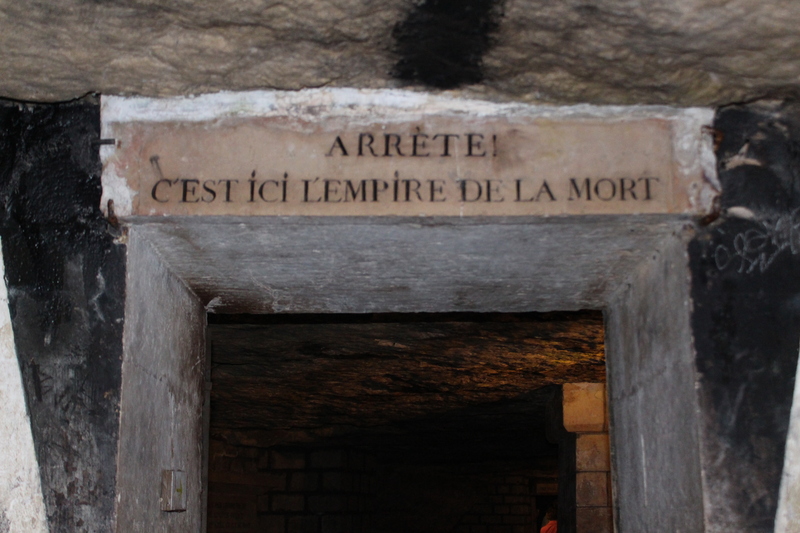 Catacombs are interesting sites to visit. I will share all your entries with the kids as this month’s geography Faces magazine is about Paris & France we just got from our postbox. Glad all’s well as I was missing your posts. Also glad it was just a technology glitch and nothing more!…. Thanks for educating all of us.